For a sleigh ride together with you. Its that time of year where the snow is on the ground, a chill is in the air, the fireplace is glowing, and good cheer is all around, especially down at Ozimals! Come join everyone at Ozimals, the bunnies, and the new Pufflings for their annual Holiday Celebrations. Ozimals has created a beautiful winter wonderland to frolic and play. There will be sledding, ice skating, holiday music and as always, special themed prizes from the folks at Ozimals for each of the parties. Just hear those sleigh bells jingling! Its that time of year to frolic in the snow, indulge in Hot Chocolate, kiss under the mistletoe, and celebrate the season in Ozimals style. Come join us for the Winter Wonderland Party complete with Ice Skating and Holiday music provided by Sierra Sugar. Ozimals is celebrating the season with a festive formal Holiday Ball. Music provided by DJ Sierra Sugar. Best dressed contest with prizes. In the Spotlight ad, originally uploaded by ~sierra sugar~. 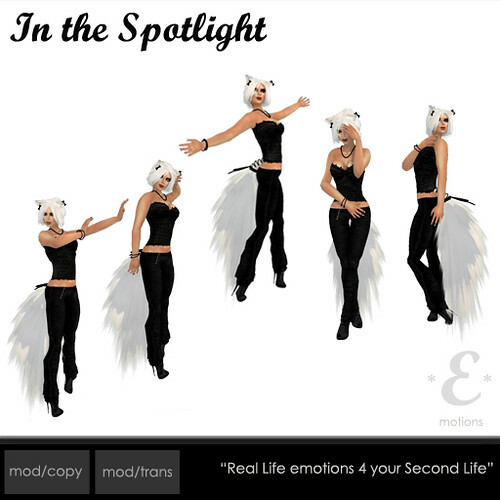 "In the Spotlight" - new pose set out at eMOTIONS. 5 cute poses for the ones who enjoy being in the spotlight, and even those who do not. The leaves are falling and so are the prices at eMOTIONS. As mentioned earlier, I'm cleaning up shop to make room for newness to come. -PRO POSERS - if you are a part of this group, you get an additional 25% off from poses in the hippo vendors. Just wear your PRO POSER group tag. -Lots of singles poses added to the dollarbie and lowbie vendors. -"In the Spotlight" - Brand new girls pose set out now in vendor. -Many items are now copy only in the store, but you can purchase as a gift from the -Marketplace (items on sale there too). -All poses on Sale 1/2 off!! -Exclusive poses only found at the Magic of Oz location. -Special bunny cuddle pillows (menu driven) and cute bunny slippers only @ Magic of Oz location. Still looking for all stores (not just poses or fashion) who will have +transfer items, gift cards, and gatchas for the holiday shopping season. Hello and happy early seasons greetings! What does this mean for you as a shop owner? Specific traffic and potentially increased traffic directed to your store during the holiday shopping season. Please do pass this notecard around to others. The more responses I get, the more comprehensive the list will be. I will make a notecard of these stores to be passed around in plenty of time for shopping, as well as sending out the list via various group notices. The list will be heavily promoted through various avenues and also be updated/maintained on my blog. Thank you so much for your time and help. .
*** If you participated last year and still qualify for the list, please return this notecard to me so I know to keep you. Many shops sadly come and go in SL and I would like to make sure every store name, location, and category is as accurate as possible. 2. I am aware that breedable pets are all +transfer. These stores and their pets will be listed as well. 3. Gatchas are new this year. If you have a Gatcha or know of a Gatcha please include this information since all Gatcha items are +Transfer. 4. "Buy as a gift" vendors in stores are not what I am looking for. Again, its the ability to be the gift giver, not have an item delivered instantly to someone. "Now" may not be their birthday or anniversary. 5. I do recognize and understand the reason many items are no transfer. This project is in no way meant to be negative in any context to content creators who do not have items that have transfer permissions. 6. This project is about sharing. Sharing creations. Sharing gifts. Sharing information. Please feel free to pass this notecard along to anyone who has a store. And once the list is created, the in-world notecard list of stores will be of course +transfer for Second Life residents to share with one another. 7. Yes I am open to suggestions on other ways to share this information with people. Please feel free to IM me or send a notecard with questions or comments anytime. 9. The website contains a list of stores by category, then alphabetically by name, then SLURL to the store, and whether the store carried +Transfer items, Gift Cards, or both, as well as a blog and/or Flickr if the store/designer lists one. 10. I will continue to update this page and advertised through various means through the holidays. It's the holiday season and we all like to be able to give and receive presents. Over the years more and more content creators have followed the trend of making items "No Trans" which makes gifting difficult. Sure many stores offer the "buy now as a gift" options which allows you to purchase and have the item sent directly to the person at that moment. But its not the same as buying a gift, wrapping it up and giving it to the certain someone at a specific time, date, place, and setting of your choosing to make the moment special. With this in mind I decided to compile a list of stores in Second Life that still offer transferable items, or at the very least have a Gift Card system. This will be a running list of all types of stores from clothing, hair, skins, poses, furniture, etc... That I will update regularly. Gifting isn't just for Christmas. Its great for birthdays, rez days, valentines day, anniversaries, and the always wonderful "just because". Continue to check here for store updates. Or visit eMOTIONS and JJ Lanes">JJ Lanes Furniture in world at the SL Gifts Kiosk to get the current notecard with landmarks. If you have or know of a store that offers transfer items or gift cards, or if a store on the list changes their location, please reply here or send me a notecard in world with the information. *all Breedable animals are transferable. The food/stat items are usually not. Only the MAINSTORE for the original creator of each breedable type will be listed. There are many in-world groups for breeders's stores, auctions, etc. Christmas2010a, originally uploaded by ~sierra sugar~. Where I come from in Real Life we have seasons such as "Summer", "August", "Hot" and "February" (where we get a slight reprieve from the heat and humidity). So Fall and Winter in Second Life for me are the most enjoyable. I love to see Sim landscaping change with the seasons. I love how all the stores fashions reflect the colder weather of wintry climates. I love the warm fuzzy sweaters and boots of all varieties. And I love to decorate for the holidays with all the little pretties I find around the grid. Second Life is a great big play ground of amazing possibilities, fantastical creations, and imagination without boundaries. So as I sit here sipping hot chocolate in my house cooled to a comfortable 70 degrees thanks to the modern luxury of air conditioning, I decorate my home Sim for Christmas. Caribbean Islands are not known for their blustery winters and snow days, so I build up in the sky. SL is great for defying the laws of physics too! In my little skybox I'm able to create a cozy snowy scene complete with frozen pond, frost covered evergreens, and a cute little wooden cabin. I string some paper snowflakes across the doorway and hang a pretty wreath on the wall. A simple Christmas tree with its twinkling lights brings a touch of festive cheer. As I sit all warm and cozy inside my cabin I can look out on my perfect little winter scene and smile. It's beginning to look a lot like Christmas.